Palace are probably best known for their more laid back rock blues than they are for their album opener Break The Silence. The track not only does exactly as the title suggests but does it passionately, at times frantically and above all beautifully. It says ‘Welcome to Palace, welcome to expectations and please do get stuck the hell in’. It’s fast becoming one of my favourite tracks of the year, something you are actually allowed to say now that October is rounding the corner. What Palace do, and have always done, is create sublime and intricate thematic mini soundtracks. Each song in its own right carries with it an entire movie’s worth of storyline and they don’t even need 5 minutes, with one exception, in which to let this happen. The combination of lyrical, musical and emotional content all combines to multiply each by a factor of 100 and wham bam thank you very much maam, you have your mini soundtrack. So Long Forever isn’t the album for you if you are looking for an album to put on before a big night out though. It’s more an album for reflective time, for a bottle of wine and a dimly lit room. Or in my case, a glass of water and a cushion over my head in the middle of the day. There’s something about listening to music while depriving one or more of your other senses, of course it intensifies it, but it’s the connection between how you listen and feel when you let this happen. I can’t deny that I spent several hours laid out on my sofa with this album playing by my head, with a cushion over my eyes. I also can’t deny that this, somewhat peculiar method of listening, ended with tears streaming down my face as I soaked up every word, every beat, guitar pang and every sentiment. Music is what you make of it and Palace are an emotive band, so I let them make me cry. With wondrously poignant songs, such as It’s Over, it is no wonder I lost my cool for a while that afternoon. Yet still, when I listen to it a fresh, I still feel that same stab of regret, loss and acceptance. “Safe to say that love is over. It’s true I know that life goes on and on. The more I’ve seen my foundations bleeding, the weaker I am from my roots to my heart.” It’s not just the lyrics, nor the repeated cry of “it’s over” that does it, the production also plays a key part. With space between notes, between breaths. The guitar clear and cutting and the shimmer of tambourines all to be heard in quiet reflection. The song doesn’t dwell nor stagnate, it all builds from having the space of slow disbelief to the rush of fear to the rise and fall of acceptance. If you give it the chance it’ll take your breath away. The guitars twinkle, groove and soar on So Long Foever, playing such an intrinsic part of this band’s sound. 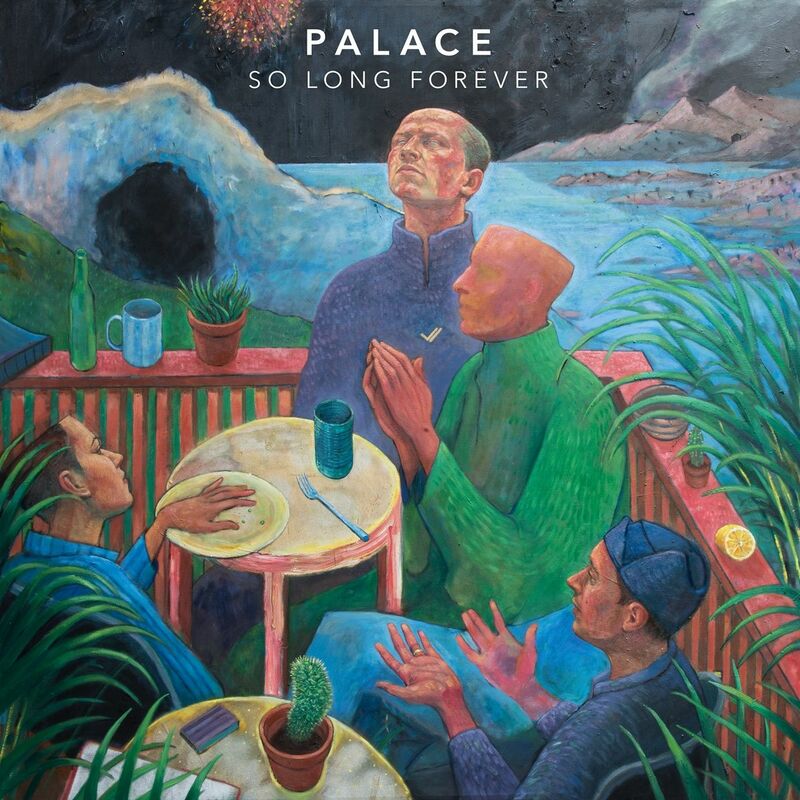 While Leo’s vocal, for me at least, is easily recognisable with it’s dusky tone, it is the culmination of everything together that very much makes Palace… well, Palace. This band recognise and flourish in the use of pace, key change and space. They don’t write songs so much as construct and develop them. The album’s title track, So Long Forever, is a perfect example of this. It drops in and out, it builds into an absolute monster of a track with the percussion and bass giving it a steady and then erratic heartbeat, never ones to keep you steady on your feet. While I’ve enjoyed getting to grips with the many new tracks on the album, it’s been enjoyable and interesting too, to see how the band’s more established material has coped with the big move into the new house. Well, I think it’s coped rather well. In the most unlikely of ways, Bitter feels like a warm hug, despite its pretty bleak theme. There’s also a very welcome surprise with it too, which I won’t spoil right now. The band’s latest single from the album is Holy Smoke. Don’t be fooled by it’s opening though. It lures you into a false sense of security with it’s gentle sweeping gestures of romantic guitar and sultry vocals and lyrics, and then, oh yeah they hit you with a dollop of anguish “you ask for my hand and I give you mine…. for the last time.” Ouch. But then it wouldn’t be Palace if it was all hearts and flowers. The album does have a tendency to deal with the darker themes of love and life, there are moments too of hope. You might need to spend a little time looking for them, but when you find them you’ll be both rewarded and relieved. The rawness and tenderness clash and combine throughout Palace’s triumphant debut album. It was suggested by a big named music mag recently that Palace could be a band to replace The Maccabees. While that might seem like a decent accolade, it’s not really because I have a place in my heart for both, and so should you. They might have the same intelligent song-writing abilities and put together a captivating live show, but Palace deserve their own time to shine in the limelight, not under the shadow of anyone else. So Long Forever should go some way in proving that point.